How on earth did I ever get organised for Christmas when I worked full-time before? I swear my brains have gone to mush. I'm forgetting even the most basic of Christmas stuff (i.e. advent calendars & cards). I've got sooooo many "to-do lists" on the go, I need a list for all my lists! 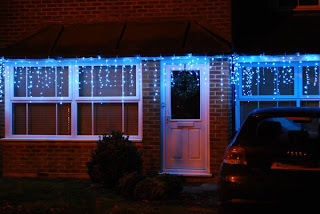 Having said that, I'm finally starting to get somewhere ... the outside lights are UP! I actually got my Christmas lights down from my attic about 2 weeks ago. I knew a couple of the bulbs needed replacing, so I thought I'd check [nice & early] and buy replacements ... 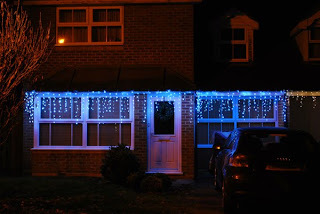 BUT ... the Christmas gremlins had obviously been at work and instead of needing "a couple of bulbs", I needed more like 100 ... heck! Do you have any idea how much replacement bulbs cost? No, neither had I until I did some on-line research. £3.50 for 4 teeny, tiny bulbs ... £3.50!!! It goes without saying, I went for the cheaper, though not terribly environmentally friendly, option of buying a new set of lights. What do you think? They're LED supabright white snowing icicles ... they can flash too, but I prefer them on static mode. Bright aren't they! Just compare them to my neighbour's (far right of the photo) ... yikes, that's what my old lights looked like ... this new set certainly has some va-va-voom!!! On the scrapping front, it's a busy time of year (when isn't?) for designers and they're producing some gorgeous holiday themed & not-so-holiday themed kits. 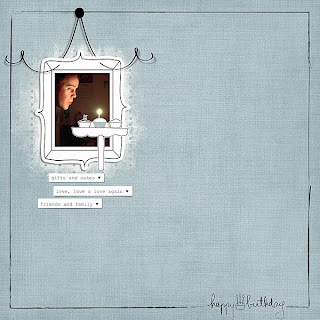 Jaime of Three Paper Peonies is doing a wonderful Advent giveaway on her blog! Opening her gift each day is such a delight and all her freebies are building into a fabulous kit. Joyce has just released her new kit Serenity and is also December's featured designer over at Mscraps! Check out the special offer she has in store for you when you buy anything from her shop during the month. P.S. there's also a special freebie if you sign-up to the Mscraps newsletter. Tina has moved to a new home at Oscraps and just check out her shop ... it's only been open a week and already it's bursting at the seams with yumminess. 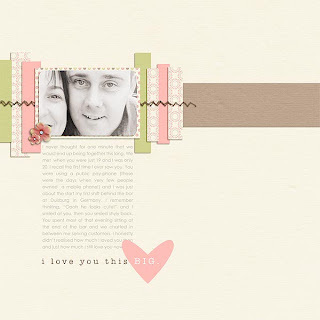 And last but by no means least, Shaui's recently released a gorgeous kit called I Love You Like and one of the pages I created with it got a mention at Gallery Standouts ... like many other digi-scrappers I know, it's always such a thrill when you see one of your own creations featured on this blog! Well peeps, I think that brings us back up to date! I'll try not to leave it so long between posts next time. I'll definitely be posting again before Christmas as I have some exciting news to share ... but more on that towards next weekend ... tease, aren't I?!?!? Stay cool Sue, this is the calm season of peace and relaxation. 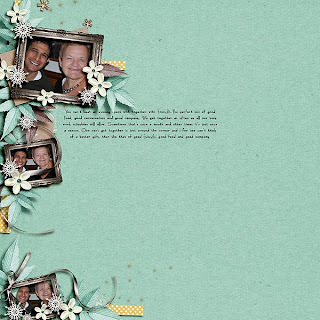 Your christmas will be as wonderful (even without advent calendar) as your layouts are here. Great job, dear!!! But I always wanted to ask what you decided concerning the laptop bag you asked. I am curious if you took one and if, which one. Lights look awesome Sue! Wish I had the energy to do that! LOL! I ended up putting up a mini Christmas tree this year.... we are leaving Saturday and not coming back till the 1st so I did not want to go all out on my decorations!! Which items did you ended up picking from your Christmas list? I'm also curious! Have a fabulous Holiday Season and don't go stressing too much! I am so with you on the working and getting ready for Christmas! Are we just getting older Sue! WOW the lights look great - you're definitely better organised than I am.